Hill Country Volleyball & Boerne H.S. 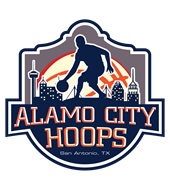 This 2020 grad is a MB/OH at Boerne H.S., competing in District 28-4A in the Greater San Antonio Area. As the only freshman on varsity this past season, Jasmine saw a good amount of playing time and has a chance at becoming a full-time varsity starter next season. 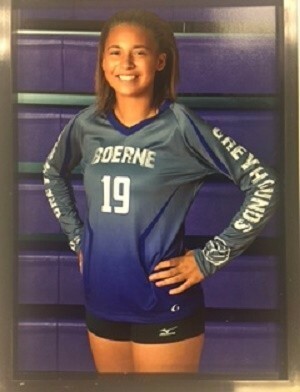 Also playing club with Hill Country Volleyball, Jasmine is certainly an athlete to keep a close eye on as she continues to embark on her young volleyball career. Standing 5'9"-150lbs as a freshman, Jasmine combines her ability to play multiple positions with her high volleyball IQ to have a bright future ahead of herself at BHS, with her Hill Country Volleyball team and beyond. Through 92 games as a varsity contributor this past season as a freshman, Jasmine was credited with 52 kills, 2 assists, 36 digs and 43 blocks (solo). We expect a big sophomore varsity campaign from Jasmine next year. As tall as Jasmine has stood on the volleyball courts at BHS and with her club teams so far in her young career to-date, she also understands the importance of her performance in the classroom. Jasmine has a bright academic future ahead of herself. For more information on Jasmine, contact our San Antonio based staff at (210) 494-6363 M-F. Please Note: If you've received an email from us regarding Jasmine Nelson, his or her phone number and email address are provided within that email for your convenience.